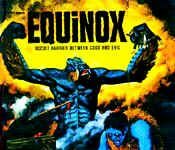 After he was attacked by a werewolf in Nepal, a man comes back to live with his sister, her son and their dog Thor, in the remote countryside. As the man tries to escape his past, it is the family dog that realizes the uncle isn’t who he is supposed to be. 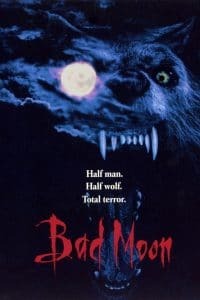 Inspired by Wayne Smith’s novel Thor, which tells a werewolf story from the family dog’s point of view, Bad Moon is probably the greatest directing success of Eric Red, who is otherwise best known for his writing skills with movies such as Near Dark or The Hitcher. In order to turn this story into a movie, Red naturally gave up the dog’s point of view concept, and built a more classic werewolf (maybe a little too classic) but still having the dog as one of the most important role. The story is nothing memorable, but not noticeably bad either. I really liked the realism of the werewolf curse. Bad Moon breaks the classic rules of werewolves but only for the best, bringing a welcomed touch of realism to the all experience. The werewolf himself is a mix of man in a suit monster, and a mechanical bust for the close-ups. Even though it does not look too real, he is fascinating to watch evolve and fight. Only the transformation scenes, made with CGI from the 90’s, are a little disappointing. The acting is really good. I really love the mum’s character, especially in the opening scene. But of course, the real star of the movie is by far the dog, “Thor”, a german shepard who really delivers a huge performance. All of this makes Bad Moon a decent werewolf movie on almost every aspect. It is not exceptional, but a great watch anyway. The final fight is awesome and finishes the movie on a good note.